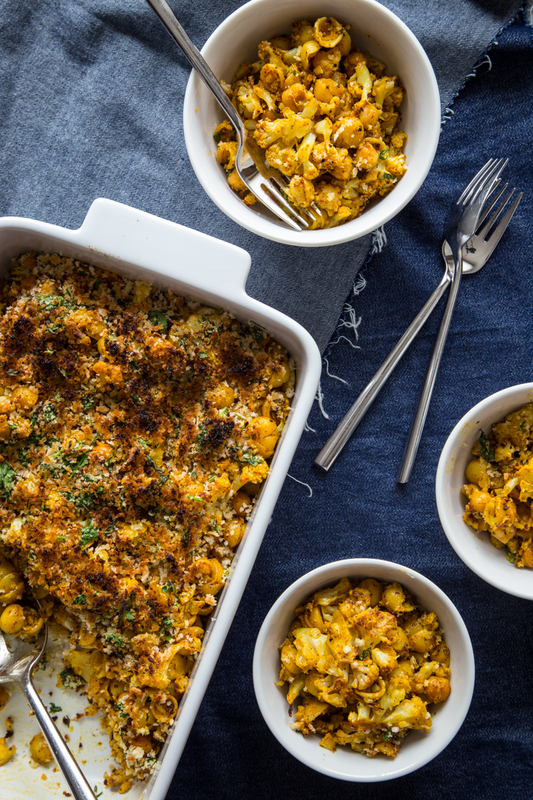 Roasted Cauliflower and Chicken Mac & Cheese is a fast and easy way to jazz up my family’s favorite boxed mac and cheese. Packed full of veggies, this meatless dinner is a winner! This winter has been flying by and I’m completely in denial that February is already here. If I don’t look directly at the calendar, does that mean that it’s still January? Yeah, I didn’t think that would work. We’ve done things a little differently the last few months with the kids’ schedules, and it’s proving to be making the evenings a bit difficult. We’ve committed to not one, not two, but three nights of extra activities. I know, it’s a bit much. Between the piano lessons, ice skating lessons and dance classes it’s been a real challenge getting us all to the table at the same time. I have to say, though, that it’s been worth it to see how adorable A & C look skating around on the ice. Seriously, so cute. 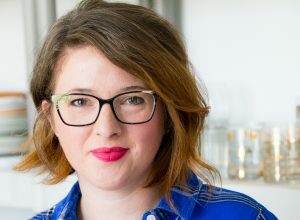 To combat the busy nights and shortening dinner time windows, I have been stockpiling quick, easy yet wholesome meals that everyone will go nuts for. That’s not an easy task. I love making our own pizzas and frittatas, but after a few weeks of that, I look into a sea of glazed over little eyes that are hoping for something new and exciting to eat. I’ve mentioned before that my kids are adventurous eaters. I love, love, love that about them! They do not shy away from flavor and while they don’t love super hot spicey food, they need serious flavor to keep them interested. 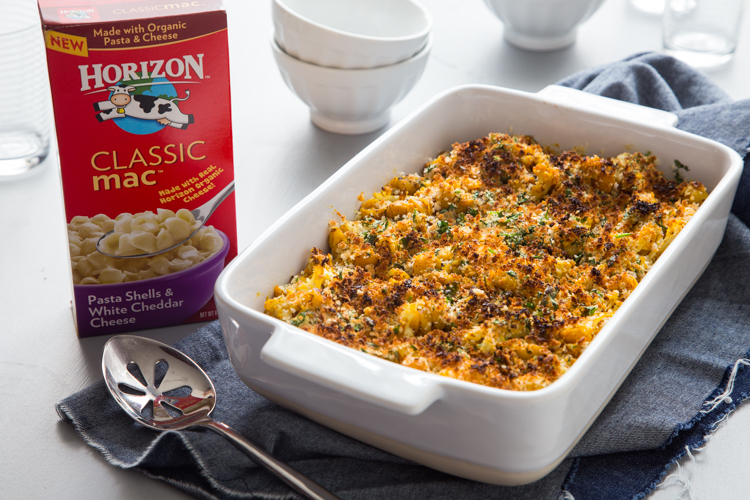 I always have a few boxes of mac and cheese around and have taken to adding some of my favorite vegetables and flavors to make a knock out dinner recipe. 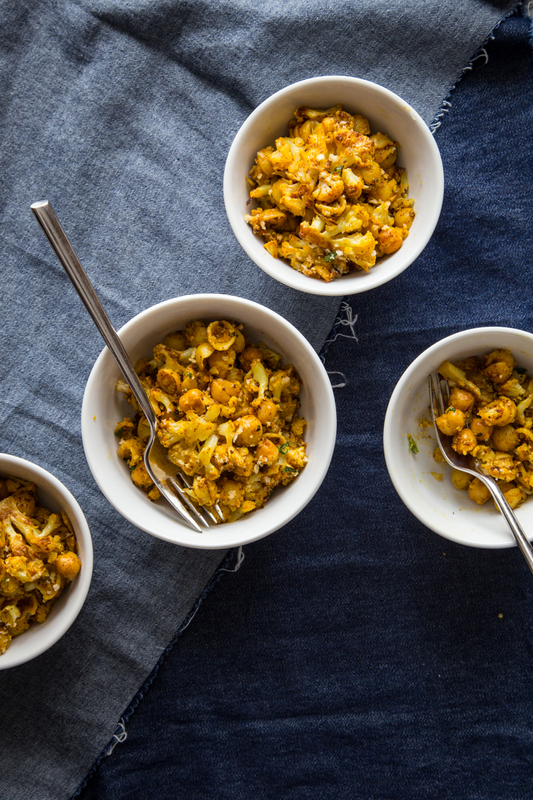 This roasted cauliflower chickpea mac & cheese is made with my kids’ favorite Horizon Classic Mac Pasta Shells and White Cheddar. You mention shells and white cheddar and their ears immediately perk up. To the mac and cheese, I added some quickly roasted cauliflower and chickpeas seasoned with cumin and a touch of chili powder. The entire dish got covered with cilantro and panko bread crumbs for a complete meal that not only the kids loved, but my husband and I couldn’t get enough of, either. Preheat oven to 425 degrees. Spread cauliflower and chickpeas on a rimmed baking sheet. Drizzle with 1 1/2 Tablespoons olive oil, cumin and chili powder. Roast for 25 minutes. Bring a large pot of water to a boil. Add pasta shells and cook according to the package directions. Drain shells and return to the warm pot. Add butter and stir until melted before adding milk, turmeric and white cheddar pack. Stir in roasted cauliflower and chickpeas and add salt and pepper to taste. In a small bowl, mix together remaining olive oil, pink bread crumbs and cilantro. 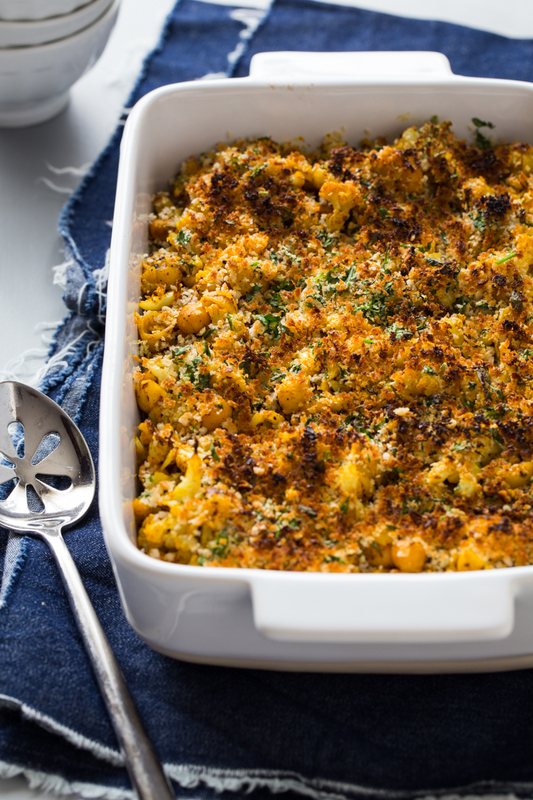 Spread mac and cheese mixture into a 3 quart casserole dish and top with bread crumb mixture. Place under the broiler for 1-2 minutes or until golden brown.